The hedge fund industry is seriously short on how it treats the subject of risk. The industry has been confusing investors by defining risk poorly and applying it post‐facto to returns. Especially in times when challenging economic and financial conditions call for high standards of professionalism to achieve success, the industry should be fine‐tuning all its mechanisms. Instead, in the core subject of portfolio risk, the hedge fund industry clings to misconceptions, is less than honest with itself, and misleads investors. The industry should rethink the role of risk in the hierarchy of investment decisions, embrace universally valid measures of hedge fund performance, and inject responsibility into the system for screening hedge funds. This paper is intended to explain why and how we need to rethink risk, and to suggest that if we do, the result can be to allocate capital to hedge funds more productively and profitably. Before proceeding, note that GIPS (Global Investment Performance Standards) are designed to fairly represent and fully disclose to investors the performance information of a firm in aggregate. GIPS is concerned with how to value assets and calculate returns in all accounts managed by the firm, to ensure uniform, consistent reporting and valid comparisons at the level of the firm. By contrast, the present paper deals with the treatment and interpretation of given returns in a portfolio, and as such is distinct from and complementary to GIPS. A full treatment of performance in hedge fund portfolios would incorporate time, without which frequency and correlation analyses related to a history of returns cannot be included. The author has chosen to forego time‐dependent analysis of returns because the focus here is on risk, which enters into each investment decision but is not a measure of performance. As Peter Drucker said, “To satisfy the customer is the mission and purpose of every business.” He didn't mean to satisfy merely in the sense of pleasing, but in the sense of retaining clients, because business is clients. When it comes to satisfying clients who invest, George Soros' cardinal rule is to protect capital in difficult markets, and Benedicte Gravrand's key to active risk management is to keep negative returns few in number and small in amount. These are various ways of saying that investors want the fat (positive) head & thin (negative) tail distribution of monthly portfolio returns to which all good managers aspire. That brings us immediately to big surprises, because nothing can ruin a fat head/thin tail faster than the unanticipated occurrence of a major event for which the manager has no effective response. An astute investor should ask the prospective manager "What is it about your investment strategy that insulates the portfolio from negative surprises and accommodates positive ones?" The answer may include a flexible strategy for leverage, an ability to liquidate positions rapidly, and limitations on participation in upside effects. Any talk of tail statistics has no place in the answer. The point is to focus on manager preparedness for surprises early‐on in the process of investor due diligence. Otherwise detailed discussions of risk analytics and risk management are uneasy and perhaps pointless. Little data may exist on how often surprises are dealt with up‐front by investors and managers, but human nature suggests it may be infrequently and inadequately. The lesson should be that unpredictability and lack of quantification do not excuse the manager from the task of dealing in advance with insulation from negative surprises. Histories of manager performance have received infinitely more numerical attention than strategies for insulation from surprises. Unfortunately, the history of hedge fund performance analytics has produced a plethora of statistics and graphs without standards for validity of application or comparison of portfolios. Industry participants are therefore obligated to find the best content and form to convey performance clearly and meaningfully, with hope that means which excel will be broadly adopted. Here is one proposal for condensing historical data into a set of figures that efficiently characterize the portfolio performance of any hedge fund. Certain statistics commonly displayed in the industry are avoided here, not to simplify, but to avoid invalid and distracting measures. These figures derive solely from returns and tell the performance story of a hedge fund. The first demonstrates how robustly the fat head/thin tail has been achieved. The second, with omega quantifying that robustness as a gain/loss ratio, plots fund performance as a single point against benchmark indices. 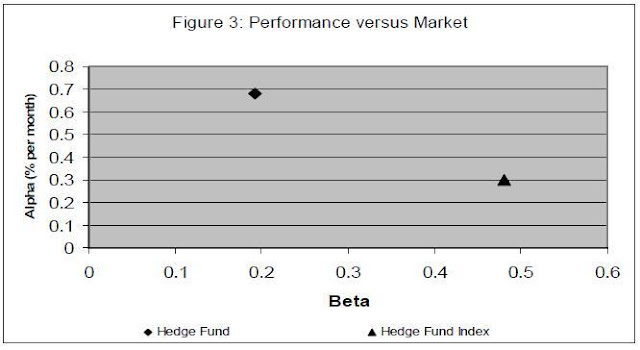 The third depicts the fund’s combination of value added (alpha) and market sensitivity (beta) versus benchmark indices. The figures inform investors about performance of the fund and frame questions about how results were achieved, such as: What aspects of strategy offer inherently sustainable opportunity? What style and skills give the manager special performance advantages over peers? Under what rules is the portfolio managed to balance pursuit of opportunity and avoidance of risk? How did the manager anticipate and respond to major market events, and which monthly returns are related to those events? Note that risk does not appear in any of the return measures displayed in these figures. It is useful to discuss risks along with opportunities in the Q&A about risk management or the source of returns, but post‐facto "risk" tools serve no meaningful purpose, as we will discuss. Since the figures relate only to the fund objective for return, investor tolerance for loss needs consideration. A simple approach is to quantify it in combinations of how much capital loss, and for how long, the investor will tolerate without redeeming. For example, the investor might tolerate 4 % loss for 7 months but not 6 % loss for 5 months. A discussion in such terms can determine whether tolerance for loss on the part of the investor and capital preservation criteria on the part of the manager are compatible. The need for such discussion underscores why capital preservation is not unilaterally quantified in the fund statement of objective. The technical elements of the foregoing are not new, and the many aspects of investor satisfaction are easy to grasp. What compels exposition is the need for quality in the central exchange between investors and managers. It is challenging enough to convey clear and comparable assessments of a variety of complex investments before further elaborating with statistics to which the parties are partial. Any distortions or distractions are less harmful if introduced, inadvertently or knowingly, only after some central truth. A person about to jump toward freedom across a deep rocky fissure understands opportunity and risk, odds and stakes, gain and loss. The act of leaping is elegantly simple, but the decision to do so accounts for all the conditions to be overcome and the consequences of failure. The relevance of such a situation may seem remote from investment decisions, but it's not. It's useful first to proclaim that there is but one reason to incur risk, and that is to pursue opportunity. In other words, without opportunity there is no reason to take risk, and yet portfolio risk has been analyzed ad infinitum and ad nauseam as a thing unto itself and after the fact. When we then ask why the word opportunity barely appears in the vocabulary about risk, we realize that the word decision also receives less than honorable mention. And that starts us thinking about how we've been thinking about risk. Over two millennia ago, Marcus Cicero insisted that if you wished to communicate with him, you should define your terms, but every generation must overcome sloppy thinking that leads to confusion in the marketplace. Much confusion could be eliminated if we would all agree that opportunity and risk, each with its odds and stakes, are what might happen due to decisions not yet made, while gain and loss are actual outcomes after decisions are made. Every investment decision in the hierarchy of decisions among investors (e.g. manager selection) and managers (e.g. adjust leverage, buy/sell a position) is a dividing point between risk management and performance measurement. 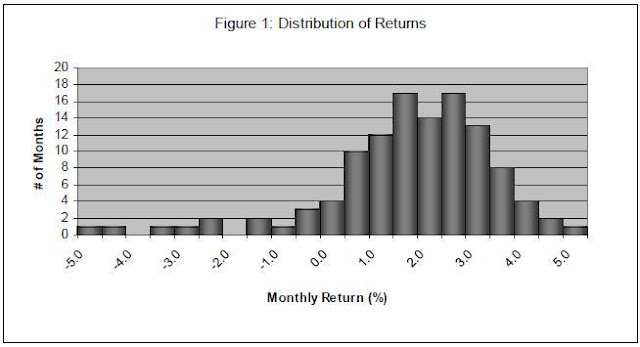 In particular, risk analysis to inform a trade decision by the manager helps to pursue portfolio success, but risk analytics applied to portfolio returns are useless because logically (1) they can't figure in any of the decisions made earlier that produced the returns, and (2) returns already booked cannot be at risk. By mixing risk with return for decades, financial theorists and practitioners have contaminated the thinking of managers, investors and service providers in the hedge fund industry. This conclusion came from taking an exploratory path with little appreciation for where it would lead. What began several years ago as curiosity about hedge fund performance reporting led first to discovery of newer measures and then to examination of fundamental notions. Others are no doubt approaching the same kind of destination from different directions. For example, starting with the notions of fear (foregoing opportunity to avoid risk) and greed (ignoring risk to pursue opportunity) can lead to the same end point. The conclusion also came with the realization that herds are not exclusive to traditional investors; professionals in alternative investments may be a much smaller herd, but they constitute proportionately as many sheep and possess a level of influence that can do damage as well as good. More generally, deeply ingrained assumptions underlying widespread practice have a hold on minds that is hard to break. But as a friend was fond of saying: "Check your premises." Some may respond to the conclusion only by defending long‐standing, widely‐accepted scholarly teachings and professional practices, but those who developed or applied tools for risk in the past have earned our respect and we owe them a sincere effort on our part to rethink and improve. When his couriers privately reported to him on the news from Waterloo, Nathan Rothschild sold big and high in London, and the herd waiting for the same news eagerly followed his lead. Then, before slower official couriers arrived, he bought big and low. He had sent a false signal to traders that destroyed their wealth in a flash. Today, wealth in hedge funds is being destroyed not in a single dramatic episode but with false measures disseminated by the industry. Before reviewing how, it's helpful to make note of the predictive value of signals by taking a short side trip to the health care industry. Galen & Gambino elegantly addressed the predictive value of diagnostic tests by quantifying how prevalence of a condition determines the validity of tests results. It turns out that a test with 90% sensitivity (1 in 10 false negatives; i.e. the test fails to identify 10% of sick persons) and 90% specificity (1 in 10 false negatives; i.e. the test identifies 10% of well persons as sick) has high predictive value only when you need it least, like in a full‐blown flu epidemic. But if 5% of a population has a condition, that test will produce nearly two false positives to match every true one. The prevalence of good hedge fund managers is debatable, but what investor wants to spend any appreciable time on due diligence of managers who are not truly in the top 5% and appear to be there only due to false positives? At the same time, investors cannot be expected to search through the chaff of the other 95% to separate wheat mislabeled with a false negative. Simply put, false signals in the current system can make Nathan look inconsequential. Close to the heart of the matter is risk‐adjusted return. It deserves mention to reinforce the statement above that "risk analytics applied to portfolio returns are useless". Imagine that you perform final inspection on a manufactured product. You reject 15% of units, send them to a rework line, call the rest yield, and send that 85% to packing and shipping. The rework department is classifying rejected units by fault, identifying causes of faults, and fixing the faults; i.e. managing risk of failure in units yet to be made. Would you as final inspector use any "risk" number to adjust yield numbers in your reports to management? Of course not, for multiple reasons, but particularly because the process of risk management will "adjust" ongoing yield. Risk has been assigned a vastly bigger role in assessing hedge funds than its companion opportunity. A major reason is its treatment for decades in risk literature, which has repeatedly equated volatility with risk. The familiar advice has been that between two funds with the same return and different volatility, pick the one with lower volatility; i.e. higher vol/risk should command higher return. The argument reduces to suggesting that in flipping a coin to win or lose identical objects, always choose apples over diamonds as the objects (same odds ‐ zero expected return; different stakes ‐ more vol/risk in diamonds). This is telling an investor with large resources to play a game of low stakes. The reasoning goes on to add that the choice demonstrates a need to adjust returns with vol/risk rather than let returns rest on their absolute basis. These ideas have been used to build a body of formulae for risk that leads in wrong directions. To his credit, Bill Sharpe has questioned the validity of his own formula. Above all things, the hedge fund industry must apply portfolio performance measures that are beyond reproach. Existing measures have been challenged and better ones have been proposed, but entities that could be influential advocates for change in practice are so far largely silent. Gaussian assumptions and all their derivative statistics have lived long and well. It is time for them to go. Bell‐shaped curves are not an expression of investor interests. Standard deviation is not a proxy for risk and serves only to waste attention on the higher frequencies and shorter durations of price variations, distracting attention from longer term ends and means. Ratios incorporating standard deviation are useless for reasons given above. The Omega function (Keating & Shadwick) has emerged (2002) to quantify the robustness (quality) of a distribution of returns. It captures all the data in any shape of distribution and preserves validity by avoiding any and all premises. It has universal appeal as a measure that is intuitive, important and uncontrived. In its simplest form as a single ratio balanced about a zero‐return fulcrum, it is eminently more useful than all the "risk" statistics currently derived from returns. It leverages aggregated monthly gains against aggregated monthly losses, indicating how well opportunity/risk prospects have been managed to satisfy a capital preservation objective. In any quantifiable endeavor, that kind of data analysis appeals directly to the fundamental need for measurable objectives. Screening can be more important than selecting in the same sense that defining options can be more important than the final choice among them. A selection will be optimal only if the best option is on the table and that will happen only if measures used for option attributes and search criteria are valid and matching. The goal of any screening step is to put an option on the table if and only if it meets the criteria. With that goal met, successive screening steps can reliably arrive at the start of selection through due diligence. The hedge fund industry is not within sight of that Utopia. Working toward it will involve commitment and participation from experts, managers, platforms, consultants, databases, associations and conference organizers as well as demands from investors. Major effort over time will be required to develop a system that directs investors toward better allocation of capital to managers. How big a payoff can be expected from this kind of effort? A system that tracks visits by accredited investors to leading online hedge fund databases has shown that the number of unique visitors to the top three sites is running at monthly rates of several thousand per site. Visitors who are unique within sites are not all unique between sites, and visitors make multiple visits, only some of which are to perform a screen, so there are ups and downs in any attempt to estimate the magnitude of screening done online. But even if we modestly assume 10,000 screens per year in total and modestly suspect that on average a screen produces one false positive fund or one false negative fund, it is easy to visualize how capital and profits in the billions of dollars could be lost over time as a result of suboptimal selection from among funds that survive flawed screens. We have considered why the hedge fund industry must rethink risk and have identified elements of correction, but that does not constitute a roadmap for revision. A few years ago Bill Sharpe told Con Keating that Omega Ratio was ahead of Sharpe Ratio in terms of acceptance at a comparable age. That's encouraging in particular, but the general situation calls for leading advocates to step forward and develop a framework for broad‐based change. The integrity and practicality of the industry are presently at risk and in need of rescue with the help of some truth. Charles T. Hage is currently Compliance Officer at Mohican Financial Management, LLC. During his career he has reviewed financial performance measures in alternative investments and managed financial risk in corporate investment programs. Copyright © 2011 by Charles T. Hage. All rights reserved. However, Assessing opportunity will be more likely a qualitative decision (if you dont consider historical data) as the future of any investment is unknowable. Manager actions to mitigate for changes in market conditions will again be a qualitative decision on the basis of the assessor. Techniques for limiting downside by any fund manager are also a question of manager preference as to they kind of strategy a manager wishes to run, due to the the fact that many techniques for limiting downside will also limit upside. Here's a spreadsheet to calculate Omega.